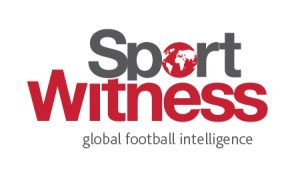 On Christmas Eve, Sport Witness covered the latest reports from Portugal on Raul Jimenez. The Mexican had spoken about a transfer and made it clear he’s open to moving during the January window. 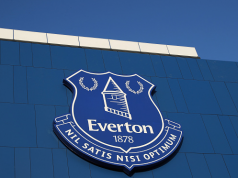 We explained that West Ham had been reported in August, in Portugal, to be preparing a €30m offer for the player, but nothing came of it in the end. Then we explained that if they made such an offer now there’s increasing signs both Benfica and Jimenez would look kindly upon it. Portuguese newspaper Record have taken that… and twisted it somewhat. In their Wednesday edition it’s stated there’s claims from England West Ham are preparing a €30m offer for the player. Of course, that’s not what was stated, and it seems Record, and perhaps Benfica, are looking to cling at any hope of getting a reasonable offer for their reserve striker who doesn’t score many goals. 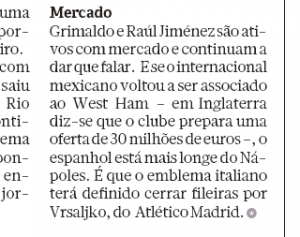 West Ham could be interested again, and €30m should easily do the trick if Benfica are being sensible, but there’s no claims of an actual offer on the way.